This entry was posted in History, Infantry Combat, Movie, Poll, War Movie and tagged Battle of Mogadishu, Black Hawk Down, History, Infantry Combat, Movies, Poll, War Movies. I can’t remember if I saw this movie. I can recall watching some scenes, but I don’t think I watched the whole thing. I should so I could vote in the poll. You know I love polls! I’ll write a review oe of these days and a few other posts on it are planned as well. Caroline: This was very close to being the last film I saw in the cinema. It’s curious that you ask the question about whether or not the film is too combat-intensive–I wonder if you mean too many combat scenes or too many grisly combat scenes? Now as to why I find your question so interesting. So there I was in the cinema–which was packed by the way–the mood of the crowd was almost euphoric and the crowd included a large number of young men. This was very recently post 9-11 and I’ll be honest to say that watching the film at a time when the drums for war were beating made me very sad. There was one scene in the film when a soldier’s body is basically cut in half and you see his entrails. Some of the audience were laughing (no joke) and I thought, here we go, young men about to be shipped off to war with no idea what it’s really like beyond the hyperbole. Even a scene like that didn’t inject a moment of gravity. I saw it on the TV, a few years later. Whe it came out I had maybe watched two or three war mmovies, not more, I started watching war movies only a few years before this blog, so in 2004. I thought that what I had heard of it, when it came out, was that it was glorifying. I didn’t think it was. With too intense I meant, relentless, you can hardly escape it while watching it. I thought it was extremely intense and was quite shaken after having seen it for the first time. I didn’t think it was too intense as I don’t think anything can make us civilians experience war, therefore, no but I think this is one of the movies, the “wrong” person can get wrong. I did think it was interesting that some people voted for it being too intense. I think it’s very realistic. I can’t help but feel that the mood of the audience reflected the times. I walked out thinking that yes there would be war and, of course, there was. Any war film that includes combat scenes will include body parts. I think the film was graphic but this didn’t seem to bother the people surrounding me. They might as well have been watching a video game rather than a film reenactment of things that really happened. I can imagine. That’s a reason why I like the mini-series “Generation Kill” so much. It depicts this dissociation. When you send a generation of video gamers to war, the result is quite shocking. Interesting topic. I actually don’t remember anything from Black Hawk Dawn…I watched it years ago and that’s it. Whether it was too intense or not I dont remember. What interesting is what you are talking here…I think its okay for a war movie to be intense, I means real war propably more intense. Yes, that’s what I mean. Nothing equals the real experience but I thought it was one of those movies where you had at least some idea of what it means. I don’t think it would need to be moe intense but it wasn’t too intense. Anyone who finds it too intense has no concept of what combat is like. It comes close to the real thing, but even a movie as realistic as this pulls punches. I clearly remember elbowing my wife in the theater when the gunship scene was approaching (the night scene when the enemy are on the rooftop and the strobe was thrown to target them) and then being disappointed when it did not show the carnage that would actually have resulted from that weapon. I find the opening scene of Saving Private Ryan to be the most intense in movie history. That is to be expected because in reality Omaha Beach would have been more intense than the streets of Mogadishu. That will probably not be topped until someone does a movie on the Battle of Cannae. I agree, the opening scene of Saving Private Ryan is extremely intense and feels realistic. Black Hawk Down just stays intense all the way through. I’m not sure we need many more movies like that. I thik there is a certain danger, if you watch to many intense combat movies you might end up like the people Guy describes, laughing and totally unfazed. You make a good point there, but war movies are rare and the graphic type are rarer, so I don’t fear the effect of the occassional war movie that would realistically depict war. We have much more to fear as a society from video games. At least most war movies are anti-war and the more graphic, the more anti-war usually. I don’t think “Call to Duty” is anti-war. No, I don’t think so at all. 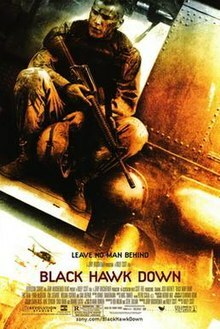 Black Hawk Down was a very good movie based on a true story.The director Ridley Scott and screenplay by Ken Nolan did a awesome job.One of Task Force Ranger main goal was to capture Warlord Mohamed Farrah Aidid.One thing that has not been openly discussed is how and when did Mohammed Farrah Aidid come into power or the beginning of events that would lead to Black Hawk Down.Operation Eastern Exit was a mission that took place in Mogadishu Somalia on January 5 1991 that many people did not hear about.If you visit http://www.nightmissiontomogadishu.com you will get a better understanding of how Mohammed Farrah Aidid came into power. I will certainly have a look, thanks for the link. I really like this movie. No matter how often I watch it. I have no idea why they tokk such liberties and it didn’t even know, I never read a book on the movie. nah you gotta read the book. Do it after the movie because you learn a hell of a lot more. As an example, the movie: We Were Soldiers Once. Great movie. Loved it. Great action, great characters, great dialogue, well produced etc. Ending was utter balls, but the movie was great. Read the book. The movie is literally half the book. The first part ois all about Hal Moore and the fight at X-Ray with his battalion 1st/7th Air Cav. When you see Hal Moore step onto the chopper at the end and his battalion fly back to their base camp there were two other battalions, 2nd/7th and 2nd/5th battalions, that had arrived at LZ X-Ray on the last morning of the battle to reinforce 1/7. Leaving X-Ray 2/5 marched out to LZ Columbus and 2/7 to LZ Albany, both a couple of klicks away. When 2/7 reached LZ Albany it was strung out in a massive line, single file and the Battalion commander had called forward to the head of the column all the company commanders…and thats when the NVA hit them, the same NVA that had attacked 1/7 at LZ XRay for the previous 3 days. The ambush at LZ Albany was a massacre. In 16 hours 154 US soldiers were killed or missing and 124 wounded. In contrast, 3 days at X-Ray saw 79 US Soldiers killed and 124 wounded. Its absolutely staggering. And its practically unknown and was not even mentioned in the movie. If you did enjoy the movie I’d highly recommend reading the book. ALL soldiers deserve to have their stories told, and 2 hours on the screen isn’t enough time to do their stories justice. I’m in two minds about We Were Soldiers that’s why I haven’t reviwed it yet. One the one hand it makes my Top 20, on the other it has elemenst which annoy me, but still, overall, one of the best. Thanks for the comment on the book. It sounds well worth reading.